Witnessing the events unfolding in Cuba and Venezuela over the past two months is a reminder that human rights also involve responsibilities and duties. Unfortunately, when those responsibilities and duties are shirked the impact on human rights and the prospects for peace are both imperiled. For example, when the Secretary Generals of the Organization of American States and the United Nations travel to Cuba to attend a Summit in the midst of a human rights crackdown and remain silent. Or worse yet, in the case of UN Secretary General Ban Ki-moon, celebrate how the dictatorship treats women, ignoring the regime organized physical assaults against the Ladies in White and members of the Rosa Parks Women's Movement. Both of these are instances when responsibilities and duties have been shirked and the impact in Cuba has been an increase in violence and was also read as a green light for the Castro's puppet regime in Caracas to begin shooting students in the head and complete imposing a totalitarian regime in Venezuela. The failure of the international organizations to respond in a timely fashion to the systematic human rights violations taking place now with graphic violence against nonviolent demonstrators in Venezuela has led to a virtual community of the shaken to take to the streets and to the internet to demonstrate solidarity with students demonstrators in Venezuela. Cuban singers Gloria Estefan and Willy Chirino have demonstrated their solidarity over their twitter accounts. Over the past two weeks Cubans both inside and outside of the island have demonstrated their support and solidarity. Yesterday, Tomás Regalado the mayor of the City of Miami, a Cuban exile, spoke out in solidarity with Venezuelans seeking freedom in their country. On February 28, 2014, family and friends of the Payá family gathered in a teach-in with an exiled Venezuelan magistrate to get an update on the situation there and to give their solidarity. 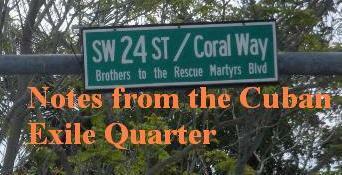 On February 24, 1996 Cuban exiles held a silent vigil at Florida International University for victims of the 1996 Brothers to the Rescue shoot down and the Venezuelan youths murdered since February 12th. Members of the Cuban and Venezuelan resistance announced a common campaign of demonstrations on February 21, 2014 in Cuba and Venezuela. 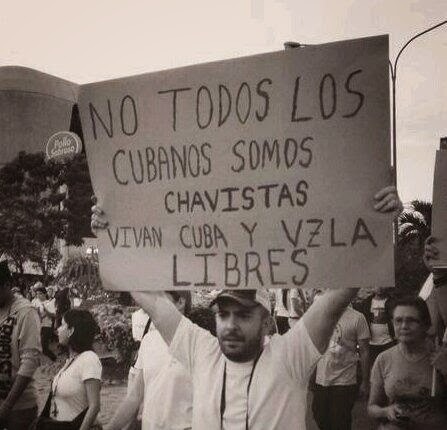 "Not all Cubans are Chavez Supporters. Long Live Cuba & Venezuela in Freedom"
This solidarity of the shaken is not passive resistance but an active nonviolent resistance to injustice. Below are examples of solidarity by Cubans with Venezuelans struggling to be free.